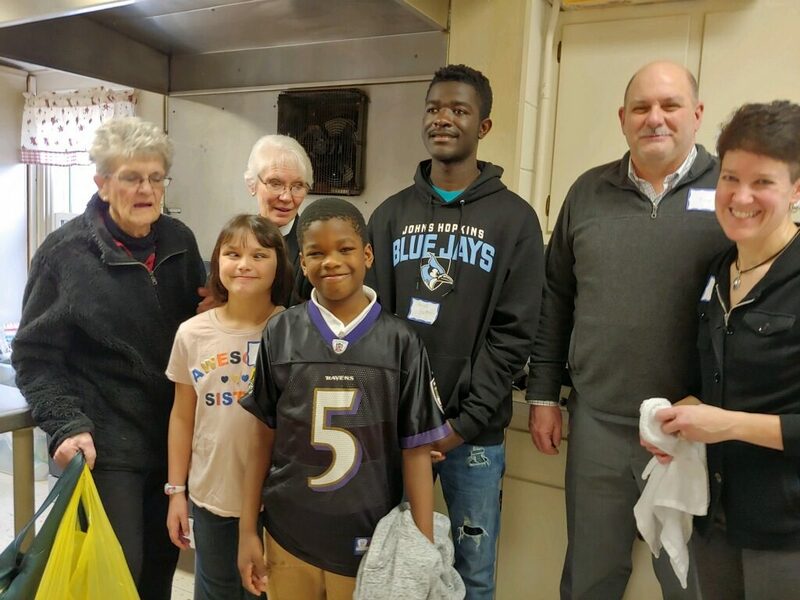 On March 10th, members of our congregation provided a dinner for a group of homeless people from the Harford County Shelter. 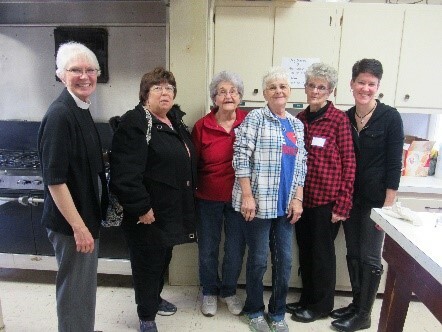 We met at the Norrisville Methodist Church Social Hall and prepared the meal there. The folks really seemed to enjoy the hot meal and the company. These are photos of the group saying cheese in the kitchen after preparing the dinner. Position needed May 1, 2019. For information, call Salem Lutheran Church Children’s Center at 410-557-6612. Poppins Party Invite Please come and join us at our annual ladies tea in the Rainbow Room at Salem Church on May 7th at noon. It will be a Mary Poppins theme. Tickets are $12.00 for adults and $6.00 for children. Rumor has it that Mary Poppins herself may drop in to visit us!!! Rev. Gohl was elected as our new Synod Bishop on June 4th of this year, and installed into Office at Evangelical Lutheran Church in Frederick, MD on October 9 by Presiding Bishop Elizabeth Eaton. Education: He has a BA from Gettysburg College and a Master of Divinity from the Lutheran Theological Seminary at Gettysburg. He is currently pursuing a Doctor of Ministry at Lutheran Theological Seminary in Philadelphia. 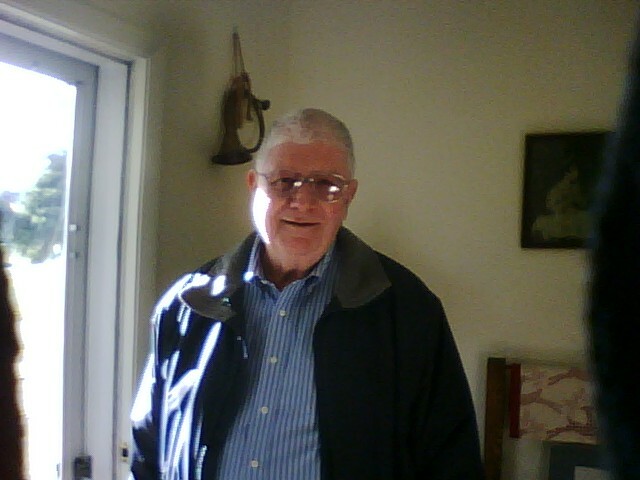 Family: Married to Arwyn Gohl of Jerusalem Lutheran Church in Baltimore. Children Saliese age 16, David age 15, Andrew age 13 and Joyanne age 8. 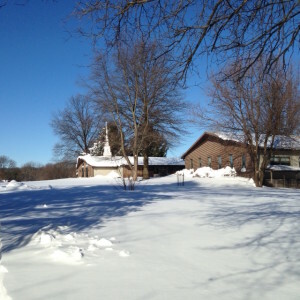 Synod’s Challenges: Congregational Health, fostering a sense of connection with our synod at large and ELCA. Plans for First 100 Days in Office: Shape 2017 agenda from planned visits with rostered leaders in the 11 conferences, October retreats with Synod Council, deans and rostered leaders, November calls for new staff leadership. Bishop Gohl will be preaching at a workshop series on November 5th at St. Paul’s Lutheran Church in Aberdeen, MD. The theme for this Saturday event is “Disciples Together” Please come join with neighboring ELCA congregants to hear Bishop Gohl and participate in two of four offered workshops. Lynn Larsen from our congregation has participated in two mission trips to El Salvador in 2014 and one each in 2015 and 2016. In February 2014, 2015 and 2016, he served with others from around the USA as a volunteer for Eye Care International. A Facebook link to that organization is https://www.facebook.com/pages/Eye-Care-International-El-Salvador/163391223765260. The website is http://www.eyecarint.org. Photos, left to right: top row – Fitting prescription glasses, optician examination, Lynn with a near-vision screening patient; bottom row – distance vision screening, registration line, cataract surgery. In August 2014, he joined a delegation from the Metro-DC Synod on its “Accompaniment” journey to El Salvador to visit and worship with sister congregations in that country. The Lutheran Church in El Salvador is a sister synod to the Metro-DC Synod. The visit included participation with three other ELCA synods and congregations throughout El Salvador in an annual procession and ceremony to celebrate the anniversary (28th) of the Lutheran Church in El Salvador as a national church. The delegation published a blog about their trip: http://2014metrodcelsalvadormissiontrip.blogspot.com. Photos: top row left to right – chapel altar where Archbishop Oscar Romero was assassinated in 1980, chapel at the Univ. of Central Am. (UCA) dedicated to Oscar Romero and near to the UCA residence where the 6 Jesuit priests were assassinated in 1989, youth group at one church we visited (Iglesia de Rios de Agua Viva); bottom – our delegation in the procession celebrating the 28th anniversary of the El Salvador Lutheran Church as a national body. 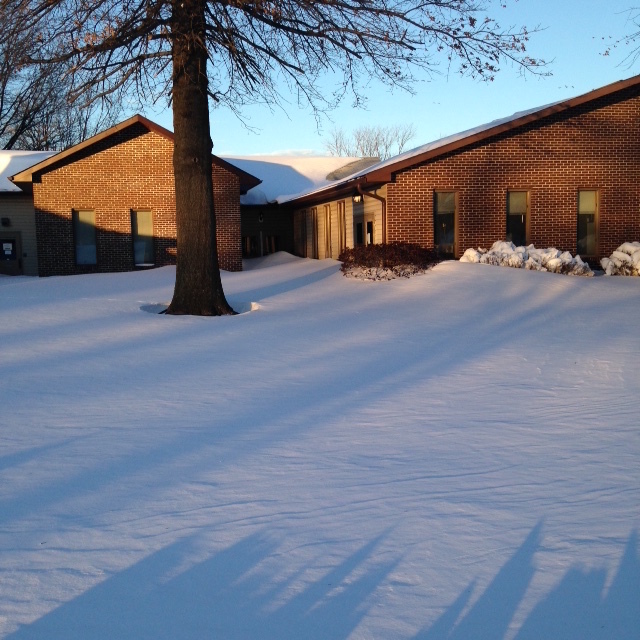 The featured image for this post is a worship service at Iglesia Nueva Esperanza. Our delegation was seated on the porch of a congregation leader’s house, and the the local congregation was seated in the sunshine in the yard. Here are a few pictures of Salem after the blizzard of Jan. 22-24. 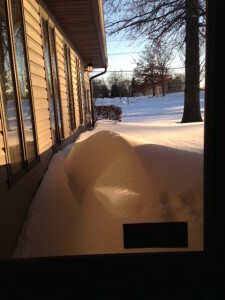 Undisturbed parking lot – and huge drifts. SLCC’s new front door security system – a 4 foot (? not actually measured!) 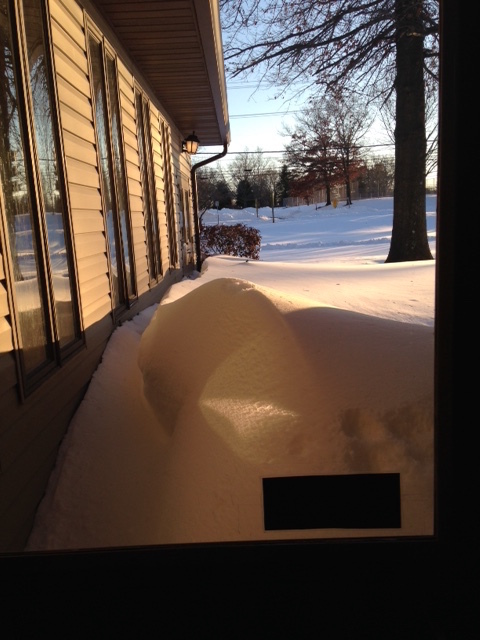 snow drift. Four feet doesn’t look quite so bad from a distance! 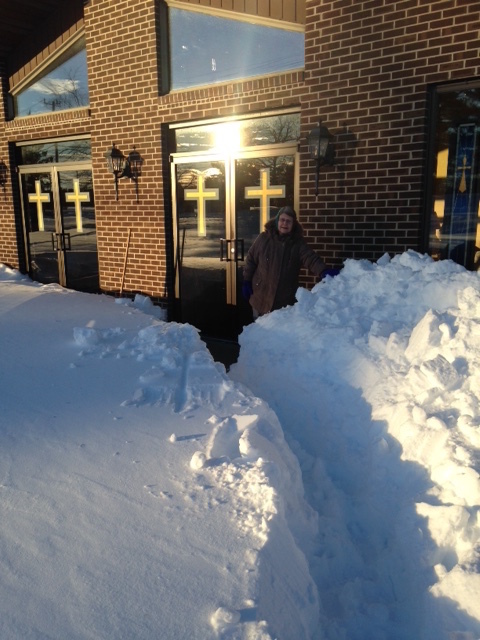 And here is Pastor Jeanne waiting at the door to greet parishioners to our late afternoon Sunday Worship Service. Too bad only she and her husband could attend! Salem’s first and founding pastor, Wayne Dornbirer, visited Salem and the Children’s Center on Wednesday, November 14, 2012. Ms. Doged gave him a tour. 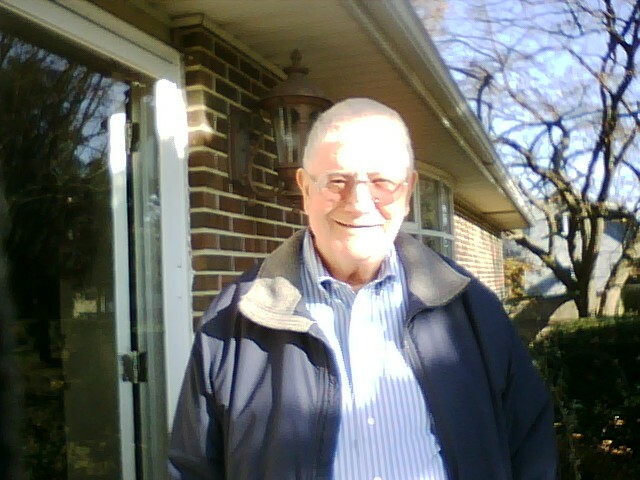 Afterwards, he stopped at the parsonage for a nice chat with Lynn Larsen. 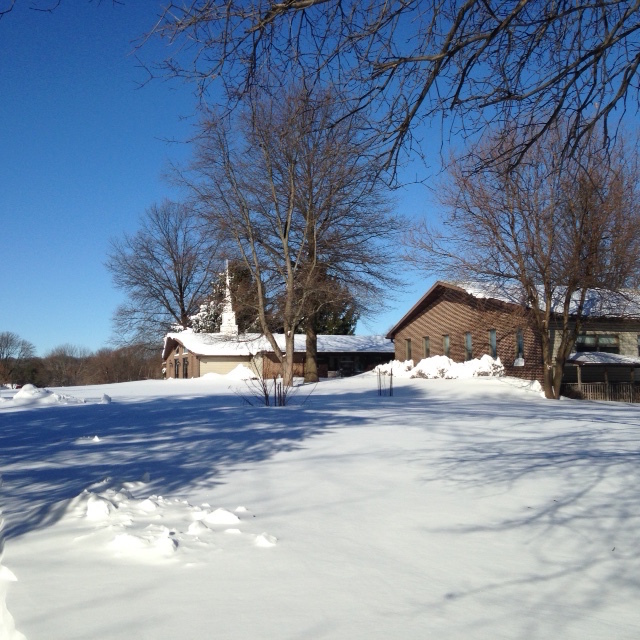 (Unfortunately, Pastor Larsen was at a retreat.) Pastor Dornbirer sends his best to all at Salem.